Students in Years 7, 8 and 9 are taught at least once weekly and are asked to complete homework every 2 – 3 weeks depending on need and application to the growth of their projects. Students are taught in mixed ability groups when they arrive in Year 7, and this remains the case throughout their time in Art and Design. Assessment takes place in the form of formal written comments led by the department’s teachers and less formal methods of reflective feedback in class critiques and peer feedback. Questioning is a key assessment tool for the department and is fundamental to the creative progress. Topics and themes are updated yearly and reflect current exhibition programmes and new areas of challenge as selected by teaching staff. Students will spend a term each year painting, printing or working in 3D. The scale and ambition of these projects is designed to aid transition to KS4. Students in Key Stage 3 respond to a range of artists and designers with contemporary and historical references as starting points, and produce a term of painting outcomes, a term of printing outcomes and a term of sculptural outcomes. The skills of painting, printing and sculpture are built upon each year and become progressively more complex. This is designed to reflect the needs of students at Key Stages 4 and 5, where in-depth investigation on a theme is required. GCSE Art and Design offers the opportunity to learn about visual communication and expression. Students will develop the skills to organise and express their ideas and observations through both traditional and contemporary approaches. Students have three lessons a week and every opportunity to work in the department outside of lessons in numerous extra-curricular activities. Homework is set weekly and is mostly practical. The course aims to foster in students a broad understanding of the nature of Art and Design. 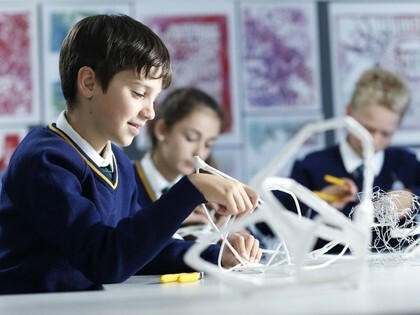 Students build on areas of experience covered in Years 7-9 as well as learning new skills in order to present possible solutions for their ideas in increasingly independent study. There is a critical and historical element to the course and students can expect at least one visit to view major work in a London gallery.